Ganden Samye trek, is one of the best natural beauty,culture; monastery in Tibet region. 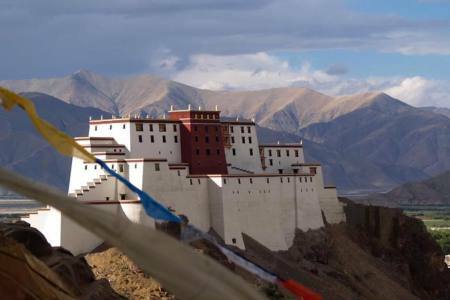 It is the most popular treks trail in Tibet connecting the famed Ganden and Samye monasteries. Its closest trekking routes to Lhasa and also one of the best trail option for those with less time. Despite the relative ease of logistics it has great mountain panoramic views and is a adventure challenging trek that includes crossing over Chitu La and Shug La, both these passes exceed (5000m/16404ft). The ruins of Ganden at the start are built high on a cliff and are attraction for many on day trips from Lhasa. One reaches the Samye Monastery at the end of the trek which is significant as the first Buddhist monastery to be built in Tibet and many Buddhists make a pilgrimage from across Tibet to visit this site. It is trekking trail will cover Tibetan culture Monastery as wel as you can discovery local life style of their people. Day 12: Drive to Gongkar airport and departure to your nest destination or home, (Hotel + B). Day 12 Drive to Gongkar airport and departure to your nest destination or home, (Hotel + B).